wow. where do i begin? only in it's second year, Cinema Eye has already started to become one of the most coveted awards in the documentary community. 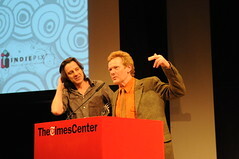 now held at the beautiful Times Center in New York City, the sold out room was filled with filmmakers, broadcasters, festival types, celebs, and old friends. The 2009 Cinema Eye Winners were announced this past Sunday March 29 and brought together luminaries of nonfiction filmmaking to honor and celebrate some of the best films of 2008. 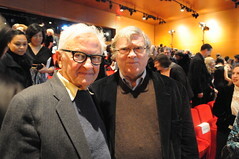 Award presenters included a bevy of nonfiction legends including Albert Maysles (Gimme Shelter), D.A. 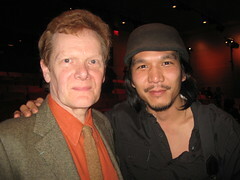 Pennebaker (Don't Look Back), experimental artist/musician Laurie Anderson (attending with Lou Reed, of course), and Morgan Spurlock (Super Size Me). The need for a new standard of award for documentaries that recognizes the breadth of the genre and includes the crafts of cinematography, music, editing and producing should have been obvious from the start. Who knows why there wasnt anything like this before... This award was conceived by and for those who had spent the year on the road watching nonfiction films at festivals all over the world, and felt that the Academy’s choices failed to fully represent the year they had experienced. Man On Wire and Waltz With Bashir swept up most of this year's awards, with one of my faves of last year, Up The Yangtze, also picking up 2 awards. Over 20 nonfiction films were nominated throughout 10 categories that celebrate excellence and innovation in the field. Pennebaker quote of the day (approximation): "It's funny that we were called filmmakers Back then, because we spent more time making equipment than making films... "
Thanks to Cinema Eye sponsor IndiePix, Bob Alexander, Danielle DiGiacomo, Matt Posorske, Jason, AJ Schnack, and Cinema Eye for a great event! Disarm was aquired and released to DVD by IndiePix just 2 weeks ago, and im proud to be a member of the IndiePix family! Find Disarm in stores, on Amazon, Netflix, and more! * note: some text borrowed from IndiePix press release.